Attic Insulation | Roof Replacement specialist In South Etobicoke, Mississauga, Oakville, Burlington, Milton. 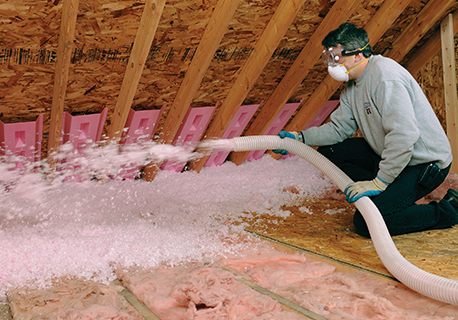 Adding attic insulation is the most effective way to improve home energy efficiency. R-Values reflect the ability of insulation to resist the flow of heat, out of a home in the winter and into a home in the summer. The higher the R-Value, the greater the insulating power and the greater the potential energy savings. The Higher the R-Value also ensures a more comfortable home by maintaining an optimal temperature range in the home. At Roofs on Homes, we believe in a higher level of comfort. We believe in Complete Comfort, where your insulation system successfully controls thermal performance, air tightness, moisture management, and acoustics. That’s why we offer the most complete line of insulation products that work together to ensure every building achieves Complete Comfort. Air Tightness: Sealing air leaks stops unpleasant drafts and noise while helping ensure thermal performance. Thermal Performance: Highly efficient insulation helps save on energy bills and create a more comfortable living space. Acoustics: Acoustics play an important role in a home’s overall comfort. Insulation helps block disturbing noise. Moisture Control: An effective vapor retarder reduces the risk of mold and mildew, improving air quality and reducing risk of costly damage from rot. 25% of energy is lost through the roof, 35% of energy is lost through exterior walls. Controlling Air Tightness: Air Tightness affects the entire building envelope and plays a major role in successfully managing heat, moisture and sound. Thermal Resistance and Performance: Heat constantly moves to colder areas, which is why homes need thermal resistance (measured by R-Value) between the indoors and outdoors. The higher the R-Value, the greater the insulating power. Improving Acoustics: We all want a peaceful, quiet home, and insulation can help by managing noise from outside and throughout the house. Roofs on Homes helps reduce exterior noise and is great for interior walls-helping quiet room-to-room sounds. Fiber glass insulation in interior walls and floors/ceilings can improve sound reduction between spaces by 5 to 15 decibels. Moisture Management: Combatting moisture intrusion is unavoidable in any home, making moisture in the wall cavity almost inevitable-and dangerous if not addressed. Not only does moisture reduce the thermal efficiency of your insulation, it can also lead to mold, mildew and rot. It’s especially important to manage moisture with brick, stone, block and stucco exteriors as they tend to retain moisture. Help Keep Walls Dry: Moisture vapor, which travels in the air, can enter the home through external air leakage and everyday indoor activities. In fact, an average family of four can create 2-3gallons of water vapor per day from cooking, bathing, washing dishes and laundry. When moisture vapor penetrates the wall cavity, it can condense on cold surfaces and accumulate in the building envelope. CertainTeed’s innovative smart vapor retarders SMARTBATT and Membrain prevent moisture build-up and are engineered to help wall cavities dry out. Unlike traditional polyethylene vapor retarders, they block moisture in the winter when humidity in the cavity is low and increase permeability during the summer when humidity is high to let moisture escape while still maintaining air tightness. Whether you’re building a new home or remodeling an existing one, you need to make sure you get the right insulation installed in the right areas. Walls, attics, basements- there are special consideration for each. Insulation: It does more than you think. It’s time to think beyond counter tops, cabinets and flooring to what’s going inside your Attics, because that’s what affects your family comfort-and even their health. Insulation can and should do more than help maintain comfortable temperatures. So as you’re planning to build or remodel a home, you need to understand that choosing the right insulation can give your family complete comfort and protect the investment you’re about to make. Energy efficiency and comfortable, consistent indoor temperatures, of course. That part- choosing the right R-value of your insulation- it’s pretty straight forward. But thanks to advances in building science, the types, and even the brand, of insulation products used in each area of your home can make a big difference in the other components of Complete Comfort: Air Tightness, noise levels and most importantly, moisture management- the ability to help reduce the potential for mold and mildew growth within your walls. This Patented, revolutionary solution can provide continuous air barrier along with advanced moisture management in a single product, helping achieve Complete Comfort. CertainTeed’s Membrain & Smart Vapor Retarder is the industry’s most advanced technology to create a better preforming home. It’s another reason why choosing CertainTeed means you’re installing much more than trusted high-performance insulation products. You’re installing confidence.